Puréed Chickpea Soup with Rosemary Garlic Croutons! 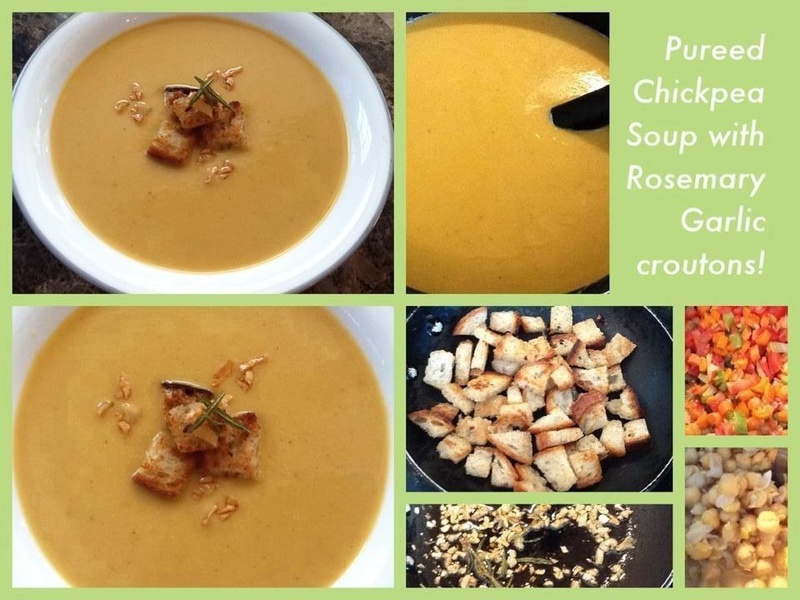 Creamy, comforting and rich in color & flavor…Yet healthy n guilt-free, perfect pick-me-up soup…for this cold dreary weather! Soak chickpeas overnight. Next day pressure cook them with one tej patta, salt and water until soft and mushy. Heat oil, add garlic, chopped onions, celery, carrots and sauté for 4-5 minutes. Now add a little chopped tomato and cook for 3-4 minutes. Add boiled chickpeas (remove tej patta) and cook for another 3-4 minutes. Next process the above in a blender till smooth. Strain this mix in a wire strainer (optional….though I like it velvety smooth!). Put this back on heat add chicken/veg stock/ water and some thyme. At this point adjust the seasoning and thickness of the soup according to personal taste! For the rosemary garlic croutons…. Heat oil, add a sprig of rosemary and finely chopped garlic. Sauté till garlic turns golden brown. Now remove the garlic from the oil and add diced country bread. Toast bread on pan and remove. Ladle steaming hot soup in soup bowls Garnish with croutons and carmelized garlic bits….sit back and enjoy the fruit of your efforts!! Spicy Twist on Grilled Cheese Toast!